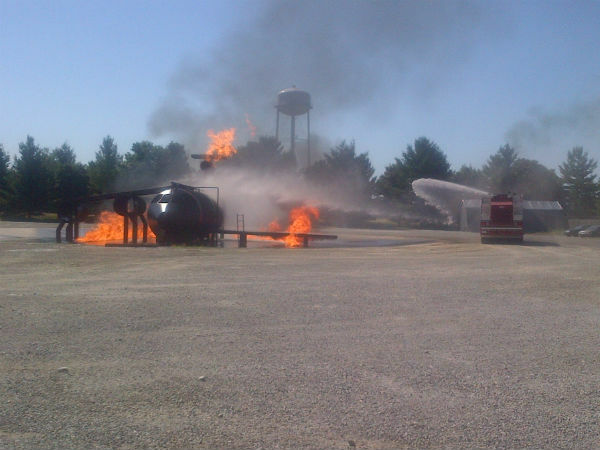 St. Louis Downtown Airport firefighters participated in live aircraft firefighting training on June 5 and June 6 at Scott Air Force Base, near Belleville, Illinois, with members of the Scott Air Force Base Fire Department. 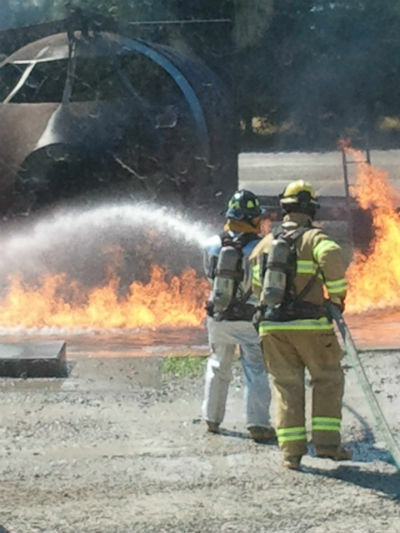 All airport firefighters are required by the Federal Aviation Administration to participate in at least annual live aircraft firefighting training and to complete mandatory re-current training each month in various subject areas. Last year, each member of the St. Louis Downtown Airport Fire Department completed more than 200 hours of training. Training Fire Photo: St. Louis Downtown Airport Firefighters hand line attack the aircraft fire. The firefighters pull hose off the truck and enter the fire area in order to suppress fire and conduct rescue, a very dangerous training operation. Training Fire Photo: St. Louis Downtown Airport firefighters target the burning aircraft with the turrets from the vehicle while in motion-- a maneuver that takes a lot of practice to remain proficient. Typically an airport crash truck will first attack a fire from a distance with the turrets in order to suppress the main body of fire. We thank the firefighters for their service to the St. Louis Downtown Airport. The construction of the fire station, a recent federal American Recovery and Reinvestment Act (ARRA) project, combined with a newly updated primary runway allow the Airport to attract larger aircraft and grow business and jobs in the region.